Spinning off from the Pagan-Musings Podcast, Pagan Weekly News bring you news, views and interviews from a Pagan perspective. 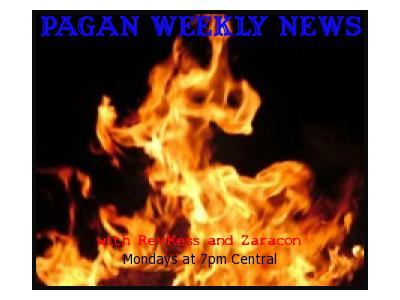 Hosts RevKess and Zaracon combine their efforts to bring listeners a discussion of some of the mainstream media events as well as Pagan media coverage. Tonight Zaracon and RevKess will discuss some of the on-going drama at PantheaCon with Z Budapest and this year's theme of unity in Diversity. Other topics will include child witches in Africa with commentary on the work of Pentacostal African pastor Helen Upkpabio, and if time allows the on-going battle for gay rights and freedoms across the United States.